Home » Articles » Is HODLY An Ideal Crypto Wallet? Is HODLY An Ideal Crypto Wallet? Of the plenty of cryptocurrency wallets available on various websites, I personally would use a fraction of them. Hardware wallets (reminiscent of a flash disc) such as Trezor or Ledger are, in my opinion, the best ones. Other types of wallets may include software-based wallets such as bitcoin core. Others are designed exclusively for mobile phones such as the bread wallet or a wallet I am about to introduce and describe in this article, called Hodly. An ignorant person tends to leave all bitcoins in the first place which is available, at an exchange (crypto exchange). This is naturally one of the least secure options because Bitfinex or CoinBase are constantly exposed to hacker attacks. Being aware of this threat, the exchanges strive to do their best to keep the coins safe. However, their effort is not always successful. If a hacker “succeeds” in breaking into the exchange you may lose all your coins. Therefore, it is important not to leave your money at an exchange but to get your own wallet, which is hacker-resistant (….unless your PC or phone is infected with viruses). One Of Such Wallets is Hodly. Hodly is a highly secured crypto wallet developed by a team of programmers within the OTN project. Hodly is a multicurrency wallet allowing storage of 13 cryptocurrencies i.e. Bitcoin, Litecoin, Ethereum, Ripple, Bitcoin Cash, NEO, TRON, already mentioned OTN tokens and a couple of others. 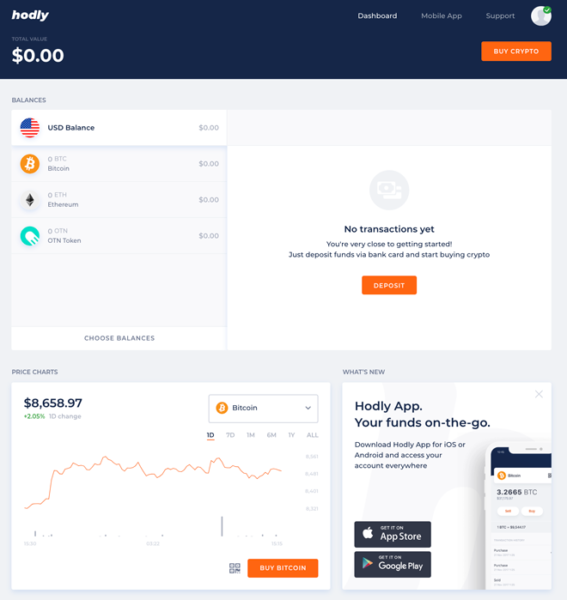 Unlike most other wallets usually acting as a storage medium for your cryptocurrencies, Hodly also allows you to perform other functions such as buying, similarly to CoinBase. Logically, this is not free of charge; the rate is about 4 %. The Hodly platform can be opened both on a cell-phone or PC. You simply enter www.hodly.com to find yourself on the applications website. There is no need to make any installations; you can log in instantly. Everything is quick and simple. This is a great advantage of the Hodly application. Will this be a more secure application than other wallets or exchanges? As you can see from the above picture, while writing this article I established a new Hodly account (with no money or cryptocurrencies on it). Let’s talk about the benefits of Hodly. You can put your money in the wallet by using your payment card and buy a crypto depending on its market price (plus a 4% fee). Option two is to transfer a crypto, which is free of charge. 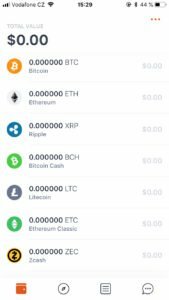 I tested the application by sending initially 1 USD to be converted into bitcoin. The transaction required only three confirmations and took about 30 minutes. The bitcoins are ready for next transactions within the application. As already mentioned, all actions are simple and fast. What I like about the app is that despite its recent development (the wallet was introduced a few months ago), everything works flawlessly. The purchase and sale of cryptocurrencies is charged at four percent, the same as with CoinBase. Despite its advantages, Hodly is only a virtual wallet allowing converting traditional currencies into bitcoins. So don’t expect any super-complex charts or indicators. There are other platforms that are designed for trading. Hodly was created for “hodling” your coins, as the name suggests. 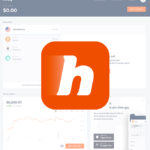 In my view, Hodly is a neat software wallet to which you can connect from your cell-phone or PC. If you look for a simple and cheap solution for storing your cryptocurrencies, safer than standard crypto exchanges, Hodly is an ideal choice. Nevertheless, you if you are going to store a bigger quantity of cryptocurrencies I would prefer some hardware wallet such as Ledger or Trezor. These offer a somewhat better-secured service. Like in other wallets, it’s a good habit to make a verification with Hodly, too. It’s not required at the very beginning, but if you want to enjoy all application’s features the verification is an important and inevitable step. The verification process is nearly identical with the one used in other platforms. The application requires a document as a proof of identity, for example, your ID card or driving license. The quality of the photo must be good to show all items legibly. Tip: Be careful when using a flash on your camera. The flash may prodauce reflection on the document! You can log in to the application with a standard password. We recommend that you use multiple security gateways such a four-digit PIN needed for all transactions. If your phone has a built-in fingerprint scanner you can boost your safety by setting this feature.